Which is now totally out-of-date, as lil' M is 11 weeks (as of today - hehe)! 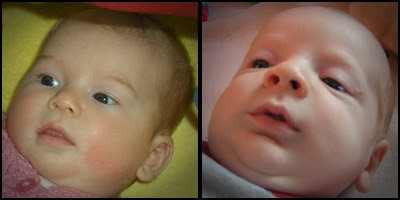 Unfortunately I didn't quite get them at the same angle, which makes lil' M look like he has serious chin issues going on, but I'm pretty sure Button had the same thing at that age ;-)! Both approx. 10 weeks; I know lil' M was in this photo, but am guessing regarding Button... if she wasn't 10 weeks there - she wasn't far off it! They're looking quite different now - even to the most untrained eye... me and hubby always thought they looked totally different; but in some of the new-born photos you could have been mistaken if you'd assumed they were one and the same baby. - Both have wide foreheads, but Buttons seems flatter in these photos... not sure if that is true, might just be the angle! Both have the same little ears, same little button nose, and same wide-set blue eyes; that grow larger than life when given a fright! - lil' M is much friendlier and takes people as they come, smiling at anyone who'll give him attention (possibly because he has to share the attention at home *grin*). I am loving watching lil' M grow, and seeing little personality traits show up as he gets older... somehow though, I don't think his placid exterior means he is going to be a walk-over! The other night we were trying to get him down for a sleep, and at the same time we were taking Button through her bed-time routine - so we were both juggling them between us. I had finally managed to get him to settle, and came downstairs to start getting Button ready when he woke again; grrrr, a regular issue at the moment. Hubby went to deal with him while I brushed Button's teeth, read her a story and got her into bed... lil' M still wasn't settled when hubby came down to kiss her goodnight, so he brought him down for Button to kiss goodnight as well. As they headed back up the stairs to his room he totally lost the plot, so hubby brought him back down wondering what on earth was wrong - he settled down again instantly. It was a case of 'I don't want to go to bed, thank you very much'; life could get interesting as he gets older and realises he has a will of his own! It is so cool getting to 'see' Lil M and Button like this, how similar and different they are in different areas. Gutted we haven't seen him in person yet!